Lonely Planet and other guidebooks have portrayed Ios as a crazy and hedonistic island. It might get somewhat that way in the heart of the high season of July and August, but I have not found it to be the over-the-top party island of legend. Seriously, there's not an ethylene seep to be found anywhere on Ios. (Ethylene being what may have given the Oracle of Delphi her odd behavior) Ios is just a very nice place to visit. Ios is easily reachable by ferry from Athens. This map shows the island's location in the central Cyclades, seven hours by traditional ferry from Piraeus, and a short hop from other Cyclades islands such as Mykonos, Naxos, Paros, and Santorini. Map of the Greece and the Aegean Sea. Ίος (or Ios) is between the orange pointers. You can travel from Piraeus to Ios on the classic Greek inter-island ferries with open decks where you can relax and watch the sea and islands slide by. One might depart around 0730 and arrive around 1400, and another might depart at 1200 and arrive at 1930. As long as I had my bed arranged ahead of time, I would take the second of those to avoid needing to be at Piraeus so early in the morning! Piraeus is an enormous port and it gets very busy with all the early morning departures, so you would have to arrive there well before your ferry's departure time. A mid-day departure sounds much better to me! 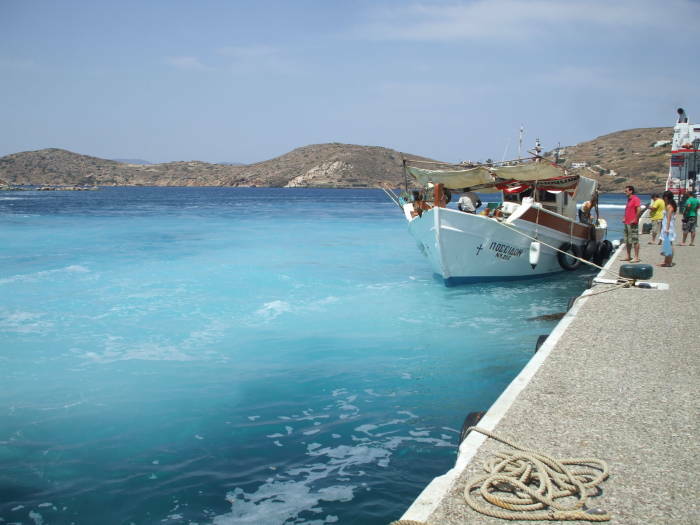 Ios is in the center of the Κυκλάδες, the Cyclades, the islands around the sacred island of Delos. 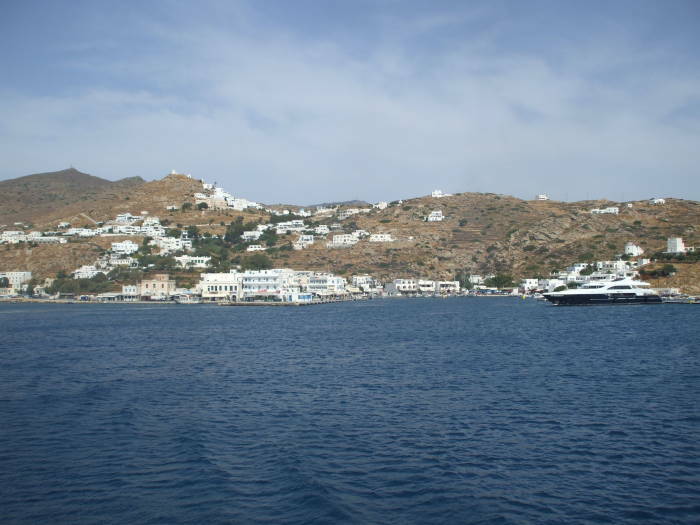 The Cyclades islands are mostly the peaks of submerged mountainous terrain, with the exception of the two volcanic islands of Milos and Thera (Santorini). 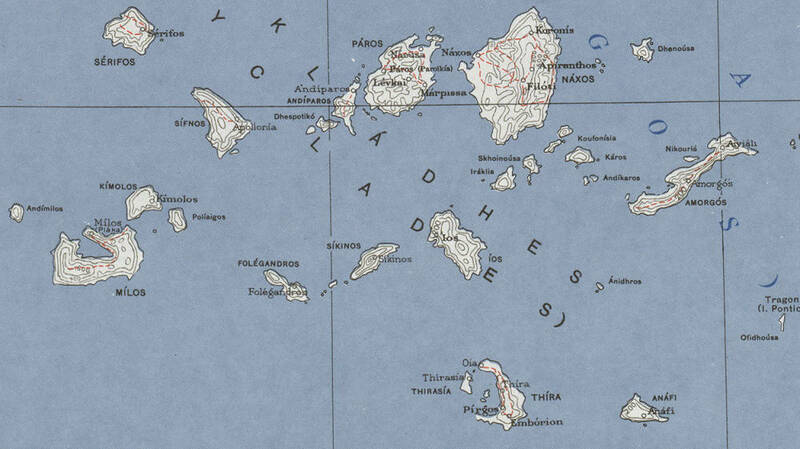 The below is a portion of a U.S. Army 1:1,100,000 map showing Ios between Paros and Naxos to its north, and Santorini (or Thira) to its south. Ios is hilly, steep and sloping down to the sea, like most Greek islands. 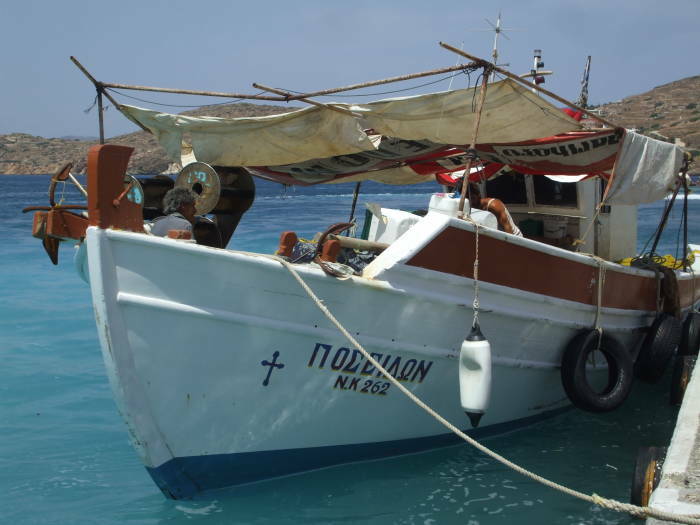 Almost all of the Cyclades are peaks of submerged mountains, except for the two volcanic islands of Santorini and Milos. U.S. Army map of the Aegean Sea. Original full resolution map available here, from the University of Texas' Perry-Castañeda Map Collection. 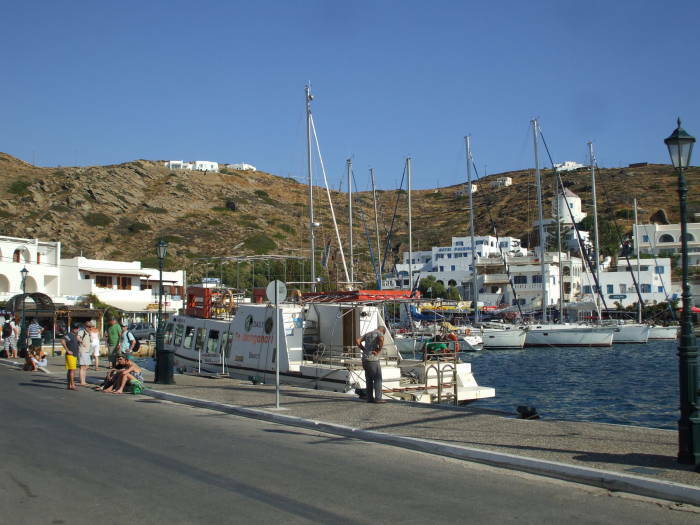 You will arrive by ferry at Όρμος, or Ormos, the port. 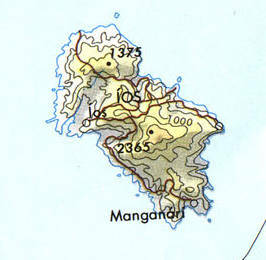 Its name literally means "The Cove". It is a very nice natural harbor. The Hora is in a saddle overlooking the port. 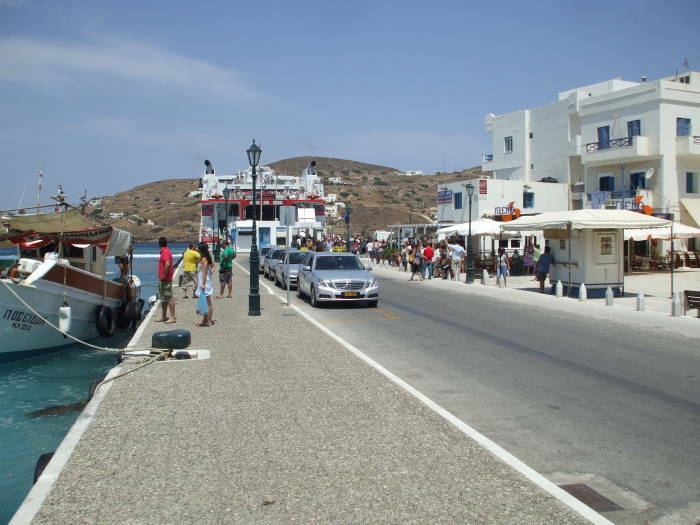 Hora, or Χορα, is the general name for the primary town of an island. 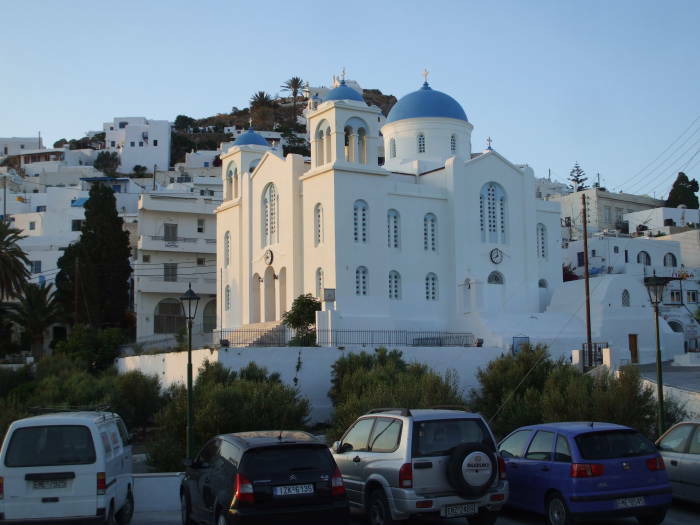 On many of the Greek islands, the main town is known simply as Hora. Ios has been inhabited since the early Cycladic period, around 3000 BCE. 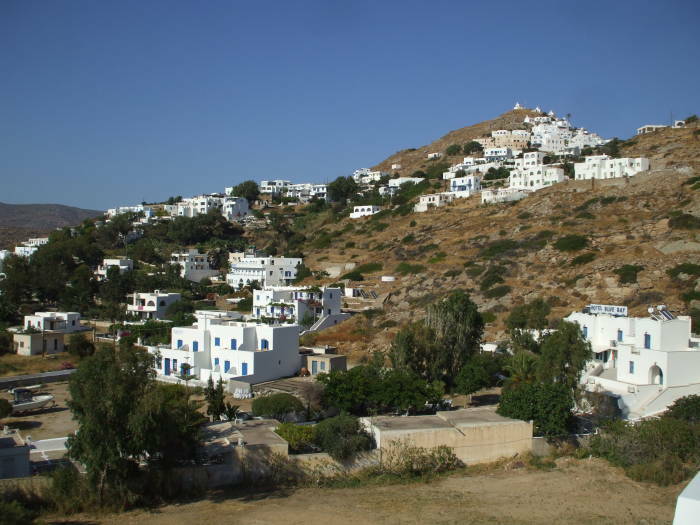 Skaros Hill has a settlement from before the period of written history, with structures preserved up to three meters above grade. Most of the buildings had two stories, with stone floors and a sewage system. Όμηρος, or Homer, is said to have some link to Ios. Ancient tradition holds that Homer's mother was from Ios, and that the great blind poet himself is buried there. The ancient town of Plakotos lies at the northern end of the island. It has signs of settlement going back to Mycenaean times. There is a rock tomb near Plakotos. The locals claim that it's Homer's, although there is no evidence supporting this. The Cyclades islands fell under Byzantine control until the Fourth Crusade sacked Constantinople and the conquerors divided much of the Byzantine Empire for their own control. Venice took control of the Cyclades, forming the Duchy of Naxos. The Venetian Duke of Naxos then handed out control of various islands to his relatives and friends. The Ottoman Turks took Constantinople in 1453, making it their new imperial capital of İstanbul. Hayreddin Barbarossa, the Grand Admiral of the Ottoman Navy, captured the Cyclades for the Ottoman Empire in 1537-1538 (except for Tinos, where the Venetians held out until 1715). The Ottomans largely left the administration of the islands to the existing infrastructure of Venetian noblemen. Aeronautical chart showing the roads on Ios. Ios seems to have been a quiet backwater for most of this. Its entire population was carried off by corsairs in 1558. A group of poor Albanians settled on the deserted island in 1575. By 1638 its population had grown to 300. All these figures are from "Depopulation in the Aegean Islands and the Turkish Conquest", F.W. Hasluck, The Annual of the British School at Athens, vol 17 (1910/1911), pp 151-181, citing earlier writings. The population grew to about 3,500 in the 1800s, but was down to 1,838 in 2001. Finally, in the 1970s, Ios became a destination for western travelers. Younger travelers would sleep on the popular beach of Mylopotos, just southeast along the coast from Ormos. We're pulling into the Ios harbor of Ormos. That's the port town itself, down around the harbor. The Hora is up in the saddle. On board the ferry arriving at Ios port. The ferry is pulling in. You need to be down on the vehicle deck well in advance, as the ferries make very fast port calls. Typical ferry calls at Ios are just six and a half minutes from the time the ramp touches down until it lifts off again, with all vehicles and passengers unloaded and loaded within that time. The klaxon is sounding and the overhead rotating beacons are spinning on the vehicle deck, as the ramp is already lowering. We have just walked off the dock and the ferry is already pulling out of the harbor. The ferry pulls out of Ios port. View across the harbor at Ios port. We're looking across the Ios harbor. Oh, and those are my parents. I was The Transporter for their big trip after my dad retired. So, is Ios nothing more than Spring Break? Well, my parents certainly enjoyed it, so I think there is more than just hedonism there. Maybe it's pretty mindless during the high season, but I would recommend visiting the Greek islands outside the peak of the high season. Ios and all the other islands are very nice places to visit during the shoulder seasons, mid-April through mid-June, and then from a week into September through October. We're looking across the back end of the harbor, toward the Poseidon Hotel. It's just a short walk (and then 99 steps up a staircase) from the ferry port. 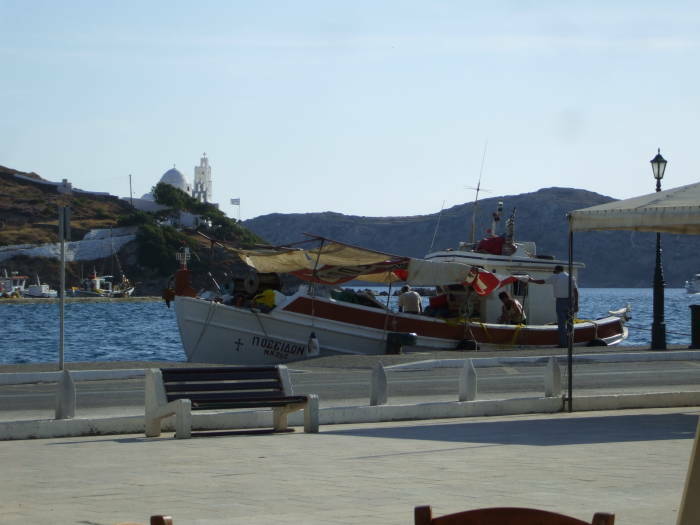 View across the harbor toward the Poseidon Hotel. 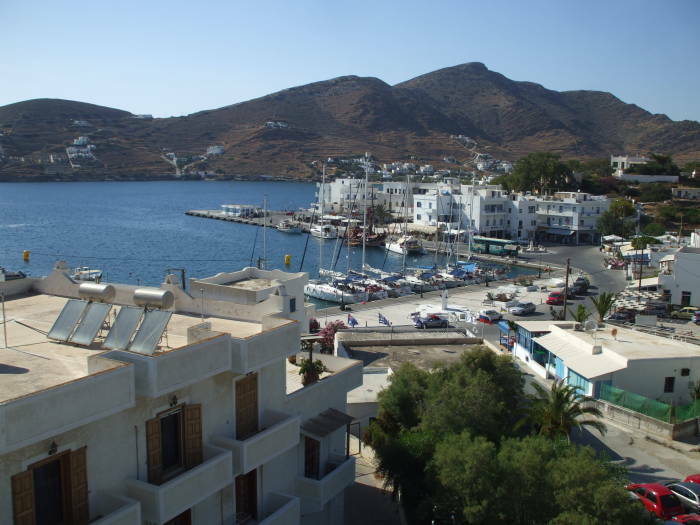 View of the harbor at Ormos, the port of Ios, from the Poseidon Hotel. We're on the balcony at the Poseidon Hotel and looking down across the Ios harbor. 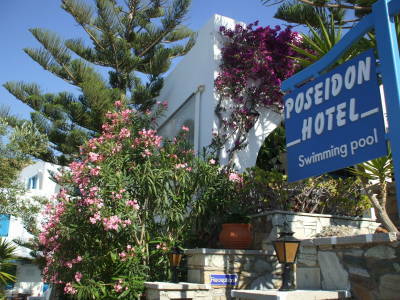 The Poseidon is a very nice place with great rooms at a low price and just above the harbor. 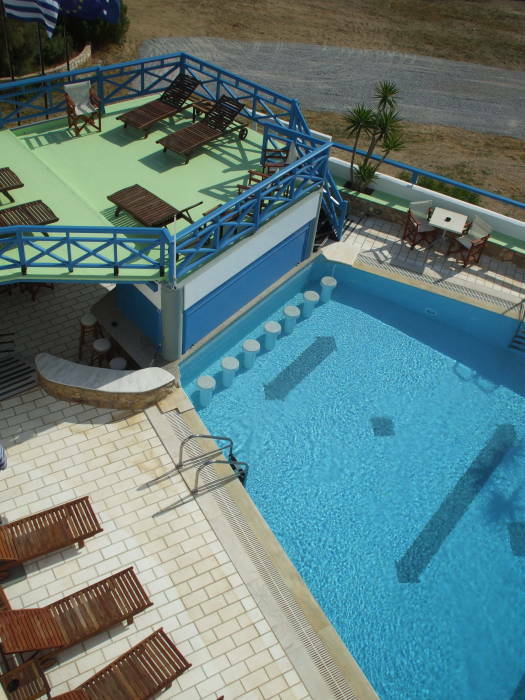 Contact them at poseidonhotelios.gr or +30-22860-91091. The Poseidon has a pool, and a pool bar where you can sit in the pool while enjoying an adult beverage. They open the bar during the high season. The Poseidon is only open for April through October. Some places stay open year-round or nearly so, others only operate during the shoulder and high season. Pool bar at Poseidon Hotel. The Hora is just above the port, up over the saddle toward the center of the island. A bus runs back and forth every 15 to 30 minutes all day and until fairly late at night. It's just a 15 to 20 minute walk if you're energetic. And if you're coming back from Hora late at night, it's all downhill. View toward Hora from the Poseidon Hotel. Getting off the bus from Hora. 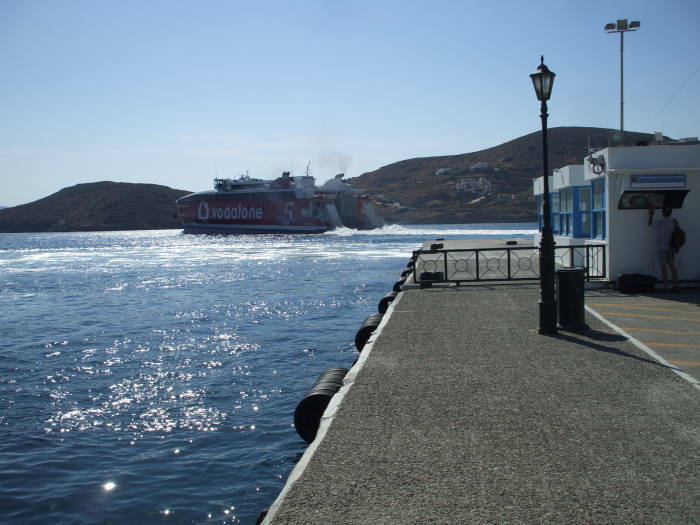 I told you that there was a frequent bus between the port and the Hora. It's a rather informal KTEL operation connecting the port and Hora frequently, and with less frequent service to outlying areas. 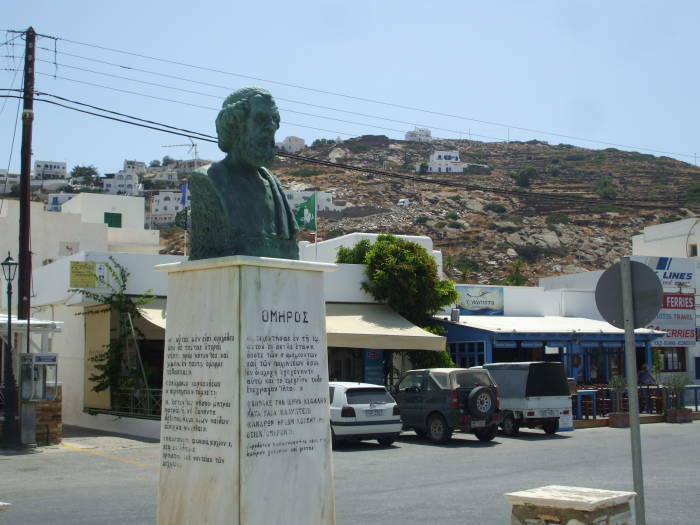 Here's a bust of Όμηρος, or Homer, at the main intersection at the port, where the bus stops. Bust of Homer at the port. 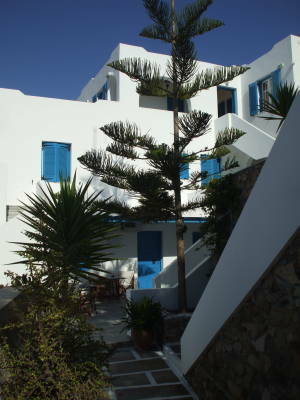 The first time I stayed on Ios, several years before these pictures were taken, I stayed at Zorba's Rooms. If I hadn't been organizing a more thoroughly pre-scheduled trip, I would have stayed here again. They're at +30-22860-91871, just off the main intersection beyond Homer's bust. A passageway leading to Zorba's rooms. 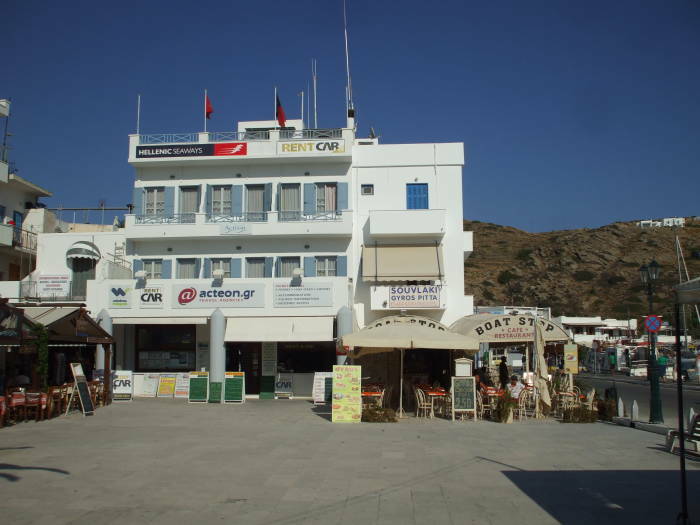 The main ferry ticket office is in this building on the main square alongside the harbor. A number of restaurants, bars, and shops are also around this square. The port area and ferry ticket office. Fishing boat in the harbor. 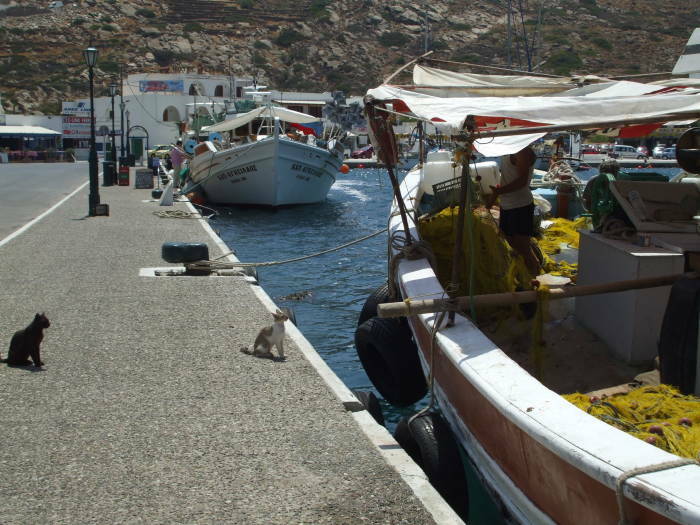 Small fishing boats also use the harbor. The chapel in the distance overlooks the harbor entrance. Ios is said to have 365 chapels, one for each day of the year. 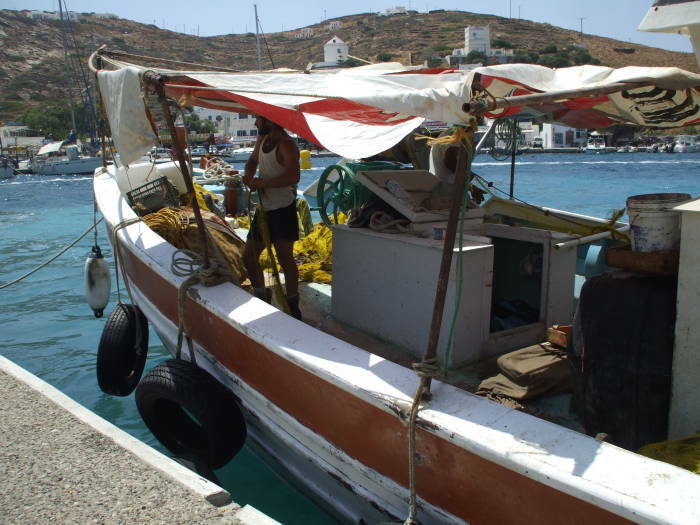 Fishing boat and businesses in the harbor. Cats await a fishy snack. I have video of the fisherman and of the cats. 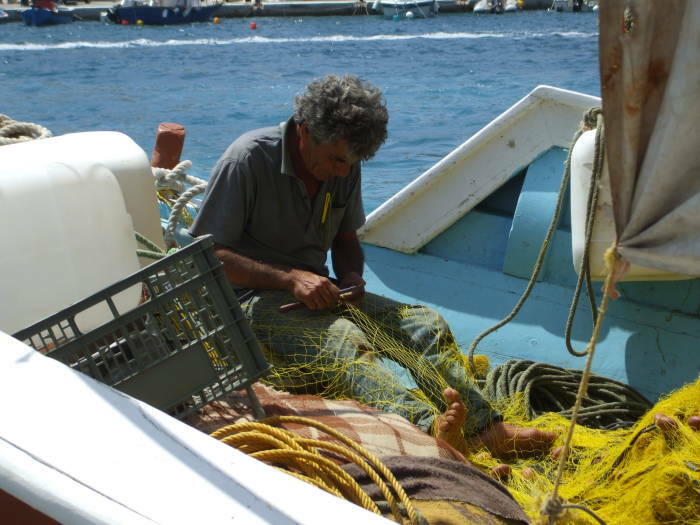 Video of the fisherman mending his nets. Video of the cats hoping for a snack. 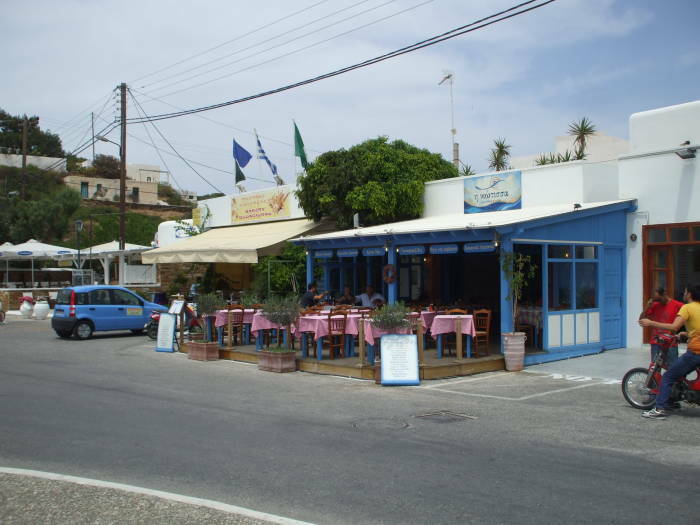 There are some nice tavernas down in the port area, good places to get a meal or just hang out. 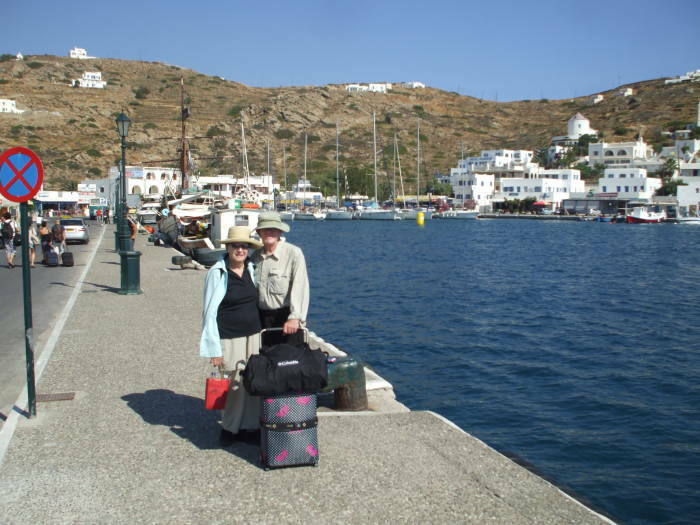 Two tavernas at the harbor. View from Poseidon Hotel over the harbor in the evening. 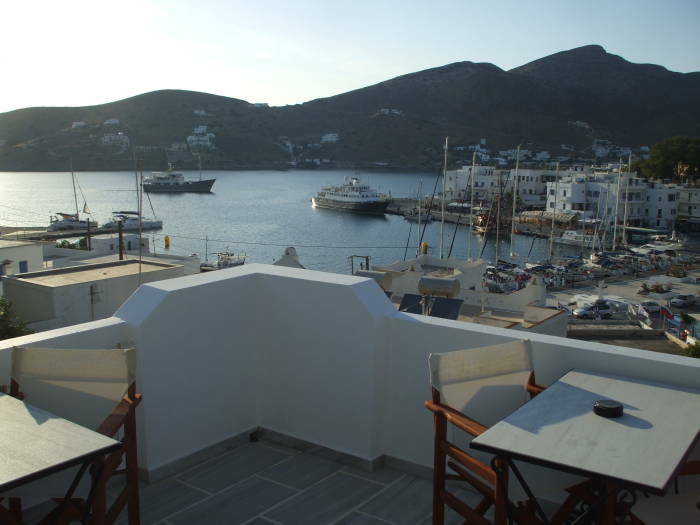 Here we're overlooking the port from the Poseidon Hotel in the late afternoon. Now we're up in the Hora, having taken the bus up the hill at the end of the afternoon. 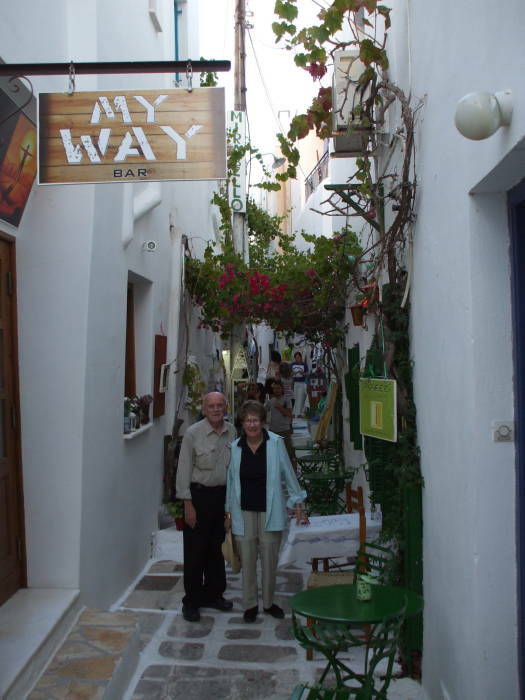 The Hora in Ios is a maze of narrow pedestrian passages lined with restaurants, bars, and small shops. Orthodox church in the Hora. 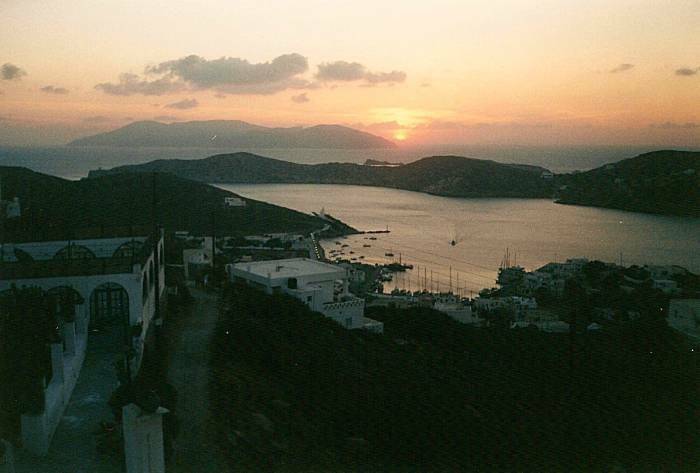 From the Hora we can look down over the port and watch the sun set. The sun is setting just to the north of the nearby island of Sikinos (this picture was taken at the end of September). 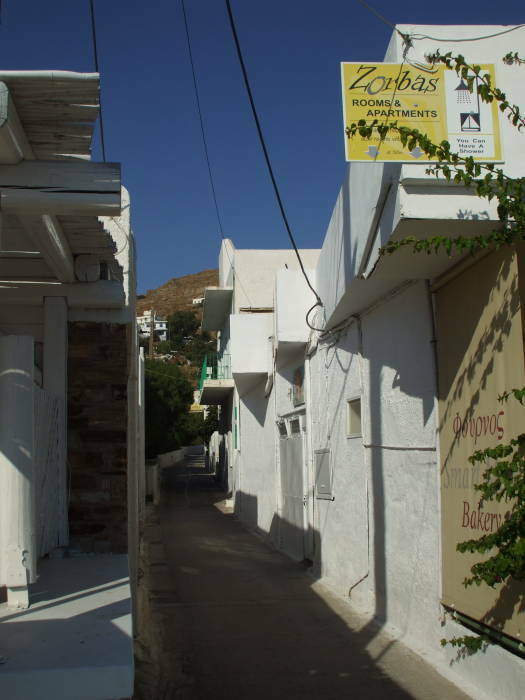 Back alley in the Hora. Sunset as seen from Hora on Ios.